When I read this verse, I am reminded of how a horseshoe is made. 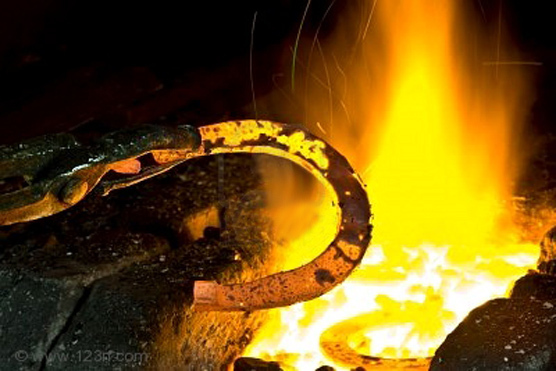 Horseshoe manufacturing begins with cutting steel into appropriate-length bars. The length is determined by the type of horseshoe being made. This is based on the kind and size of the horse, and whether stance (also referred to as horse conformation) issues need to be addressed. The bars are then heated to between 2,200 degrees and 2,300 degrees Fahrenheit, placed on a mold or horseshoe shape outline, and a machine bends them into the familiar U shape. Most manufacturers use drop forging to press the bent metal into a horseshoe. The metal is forced into the die or mold using a powered hammer that is dropped on the metal, and then exerts a tremendous amount of force to form the final shape. The amount and length of the applied pressure is monitored and determined by a forger who operates that particular piece of equipment. Just think about it…bars of steel are heated to between 2,200 degrees and 2,300 degrees Fahrenheit, placed on a mold, and then they are forced into their final shape by a machine that applies a tremendous amount of pressure to force the steel into the mold. Sound familiar? We are those bars of steel that need to be bent into something that God can use. Sometimes the pressure God uses to bend us to His will can be uncomfortable or downright painful. He uses difficult circumstances or heartbreaking situations to mold us into a person who will glorify His name. As a single mom, I have dealt with the fire of poverty for years now. I have struggled to pay the bills. I have felt the guilt over not being able to give my kids everything they want. I have never had the money to buy a newer, more reliable car, so I constantly worry about my vehicle breaking down. I am still in this situation. I am still being molded by this fire. I know what God wants from me, but it doesn’t make things any easier. God is using my circumstances to mold me into a person who trusts HIM with every aspect of my life. I am a born worrier. I am working on this, though, because I want to glorify God with all of my heart. God wants me to be willing to step out in faith and surrender EVERYTHING I worry about to Him. Surrender my vehicle. Surrender my kids. Surrender my finances. My heavenly Father is getting me to the place where I am willing to let go of everything, believing that He will provide what we need. I really struggle with this. It is an every day battle, but I am growing in this area and I am learning every day to open my hand a little more and let go of what I can’t control. I have to have complete faith in the one who is in control: GOD. I’m a work in progress, but aren’t we all? If God has placed you in the fire, there is a reason. He will not leave you there and you are not alone. Go to Him in prayer and ask Him what it is that you need to learn. Ask Him what heart issues need to be resolved before you can be that vessel that He can use. Then quiet your spirit and listen for the answer. Our loving Father will tell you what you need to know. Your situation is not hopeless. God is in control and ALWAYS will be. You WILL survive this and you will come out of it someone that God can use to glorify His name. If you are in need of prayer or just need someone to talk to, contact me. I am here to walk through the fire with you. You are loved, my friend!